Vietnam is ready to establish a free trade area with Eurasian Economic Union. The country is also planning to cooperate with Russia in building an NPP, assembling cars and offshore development. As of today, mutual investments of Russia and Vietnam amount to $4.3bn. Trade had been stably growing before 2014 when it dropped by 5.6% due to unfavorable macroeconomic conditions, depreciating RUR and expiring contracts. The key topics discussed during Russian Prime Minister Dmitry Medvedev’s visit to Vietnam were trade, investments, nuclear energy, oil and gas, military equipment. Inter RAO and North Power Service JSC agreed to modernize Vietnamese power plants. In the nuclear sector, Russia and Vietnam will shortly sign an agreement to build the first Vietnamese nuclear power plant. Russian Railways and Vietnam Railways have signed a cooperation agreement and may shortly build a railway in the south of Vietnam. Russia and Vietnam are planning to implement at least 27 joint projects. “Each of them has a roadmap. 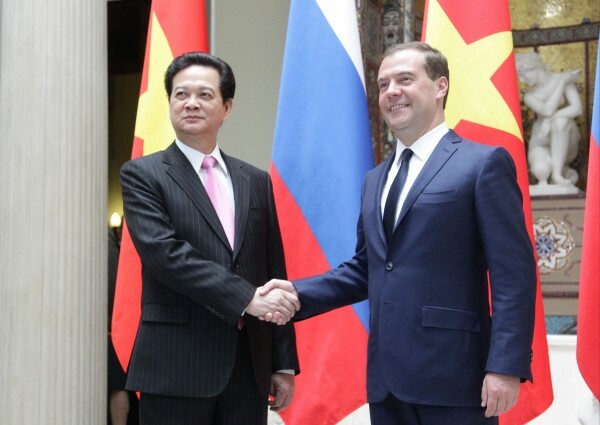 So, we hope that all of them will be carried out,” Medvedev said after a meeting with his Vietnamese counterpart. On Monday, Vietnamese Prime Minister Nguyen Tan Dung said that Vietnam hoped to create a free trade area with the Eurasian Economic Union. “We have come to terms on almost all parameters, so, we hope to sign the agreement very soon. This will give us access to each other’s markets. For Vietnam this also means access to other markets, i.e. additional 40mn people,” Medvedev said. According to Tan Dung, oil and gas remain a priority for Russia and Vietnam, so, there will be more investments in such projects. On Monday, Gazpromneft bought 49% of Dung Quat oil refinery. The Russians hope to upgrade the company and to enhance its capacity from 6.5mn tons to 8.5mn tons a year. According to Reuters, Gazpromneft wanted to buy the Vietnamese refinery in late 2013 and was planning to redouble its capacity to 10-12mn tons. One more big players having interests in Vietnam is China. So, the Vietnamese Prime Minister is going to visit China shortly.